Where other companies have diversified into other sectors MSI have been concentrating on developing their presence in the component sectors of graphics and motherboard hardware. In the main they’ve done this by emphasising MSI predominantly as a gaming brand to enthusiasts, whilst also including a range absolutely tailored to high-end overclockers and those with similar niche requirements such as 4-way GPU configurations. Additionally, in recent years their GAMING range has spanned both motherboards and graphics cards; linked branding has been a relatively new innovation for MSI. This is not to say that they don’t also have a considerable presence in the mainstream market, just that premium products tend to have more time in the limelight. When approaching their Intel Z-series motherboards (i.e. those which support oberclocking and other premium features) MSI have recently split their branding into three key sub-brands: GAMING, with gaming features and livery; XPower/MPower for dedicated overclocking; and simply MSI branded for mainstream users or those eschewing garish aesthetics. Different gradations exist within each product line, as well as certain special editions such as the black and white ‘Krait’ motherboards, but that’s generally a good summation. For Intel’s Skylake launch we have the pleasure of reviewing MSI’s Z170A GAMING M7, a very high end motherboard which is part of the relaunched GAMING M line. Somewhat ironically given that the branding was intended to set them apart, MSI have needed to rebrand very slightly (by adding the M) due to encroachment by competitors; obviously they must have been on to something. Not quite the flagship design – that honour belongs to the bestial GAMING M9 – it nonetheless comes with all mod cons and support for overclocking, to the extent that not doing so definitely sounds like a waste. Unlike previous launches MSI appears to have made an effort to clearly distinguish the pros and cons of each member of the gaming line. Previously it did seem like there were only small differences between each member, whereas now it’s quite clear that there are significant steps up in feature-set as you ascend the range. That’s great for cutting down on customer confusion (which is always a problem with a major platform launch) but could backfire in a competitive market. 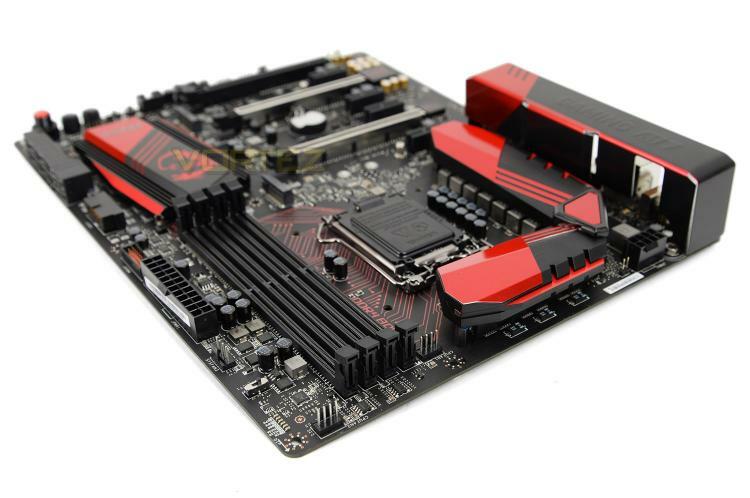 The GAMING M7 is, unsurprisingly, a motherboard for gamers. Even so, it performs more than lip-service to the idea of overclocking by adding more robust power circuitry and cooling to the basic design. It’s not quite as kitted out with heatspeaders and PCB shrouds as its bigger brother, but comparisons to the GAMING M5 certainly throw it into start relief thanks to some cool aesthetics and nifty automated overclocking tools. So, whilst you don’t see water cooling ports or ‘PCB armour’, you probably won’t feel hard done by if stretching the legs of your CPU is in your future.